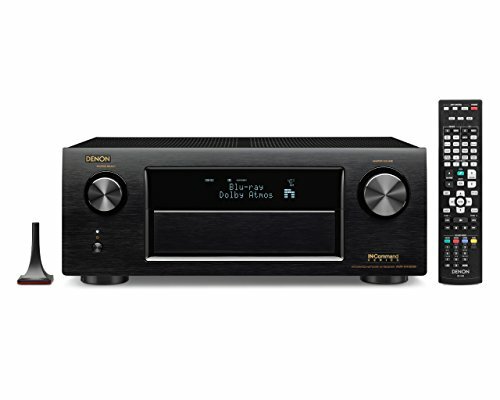 The AVR-X4100W 4K Ultra HD 7.2 Network AV Receiver continues the heritage of excellence and innovation from Denon's acclaimed mid-range AV models by incorporating the latest surround sound technology, and is packed with virtually every desirable feature for outstanding home cinema and music enjoyment. The 7 channels of powerful amplification are rated at 125watts per channel, easily enough to drive most types loudspeakers, even in large rooms. Denon's latest DDSC-HD discrete circuit and AL24 signal processing provide noticeable improvements to the sound. Furthermore, DSD and AIFF audio streaming provide access to the latest file formats. When connected to a compatible Denon Blu-ray disc player, DENON LINK HD provides playback with the lowest digital "jitter" for the cleanest possible sound. For the ultimate surround sound experience, the AVR-X4100W features next-generation sound format decoder for Dolby Atmos, which lets you add Height/Top speakers to dramatically expand the soundstage, along with dual subwoofer outputs for systems with two subs. Featuring a total of 8 HDMI inputs (including one conveniently located on the front panel), the AVR-X4100W also has 3 x HDMI outputs offering flexible multi-room options. This receiver is also equipped with advanced video circuitry capable of upscaling video signals to 1080p and up to 4K/60Hz full-rate video. With Wi-Fi Network connectivity and Blue Tooth this exciting new model opens up a whole new world of listening enjoyment including programs from a vast range of internet radio stations, as well as music from streaming services including SiriusXM, Spotify Connect and Pandora (subscriptions required). If you have any questions about this product by Denon, contact us by completing and submitting the form below. If you are looking for a specif part number, please include it with your message.